A sign posted on Bestia's Instagram account states the downtown L.A. restaurant will be closed over the weekend because of a kitchen fire. 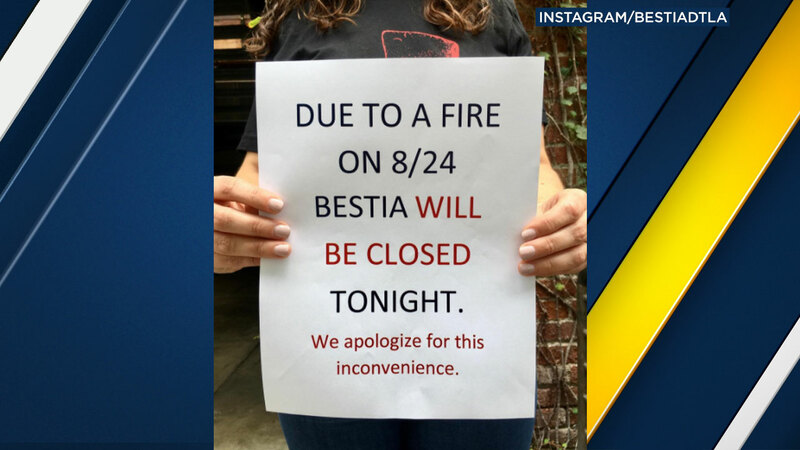 DOWNTOWN LOS ANGELES (KABC) -- Bestia, a popular restaurant in downtown Los Angeles, will be closed over the weekend after a fire in the kitchen damaged the business. The restaurant posted on Instagram that a fire started in the kitchen during dinner Thursday night. The business was shut down mid-way through service, according to the post. No one was hurt, but the restaurant suffered severe damage and required repairs. The post said Bestia will be closed through the weekend as staff and repair crews clean up the damage. "The team is working hard to make sure the restaurant is back up and running as soon as possible," the post said. "We are very grateful to our local Arts District firefighters, as the health and safety of our guests and staff are most important."